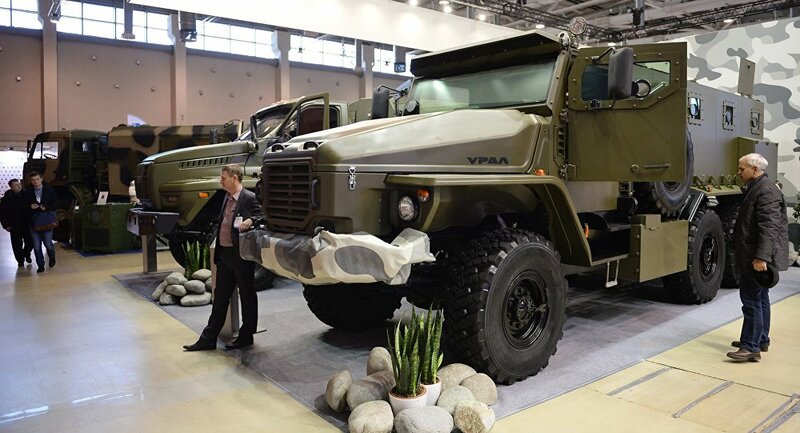 The first Ural-VV armored car, adapted to the requirements of the Russian Defense Ministry, will be manufactured in 2016. MOSCOW (Sputnik) — The first prototype of a new version of the Ural-VV armored car, adapted to the requirements of the Russian Defense Ministry, will be manufactured in 2016, the head of the ministry’s Central Research Institute Test Centre for Automotive Engineering said Wednesday. "Ural automotive plant received a technical task for this vehicle from the ministry. It is planned to make minor improvements in accordance with the requirements of the ministry, in particular, to establish a system of collective protection and so on. Once all the documentation has been processed, work on making a prototype will begin. We expect that the vehicle will be ready later this year," Col. Andrei Koltukov told RIA Novosti. The Russian Defense Ministry plans to test and explore the possibility of admitting the Ural-VV into service later in 2016, he added. The Ural-VV armored combat vehicle offers enhanced protection to its passengers, cargo and key units against small-arms fire and landmines. The armored car is a derivative of the popular Ural-4320 truck with a 6x6 wheel configuration. Its maximum speed is 90 kilometers per hour (56 miles per hour) and it can transport at least 15 people.